Isis have become locked in deadly combat with the Tusken raiders, after the Jihadis began using Tatooine as an entry-point to Libya. The spread of Isis throughout the region has typically been marked by the brutal subjugation of local peoples, but experts think that the religious fundamentalists were probably unaware of the presence of an alien race in Tunisia. 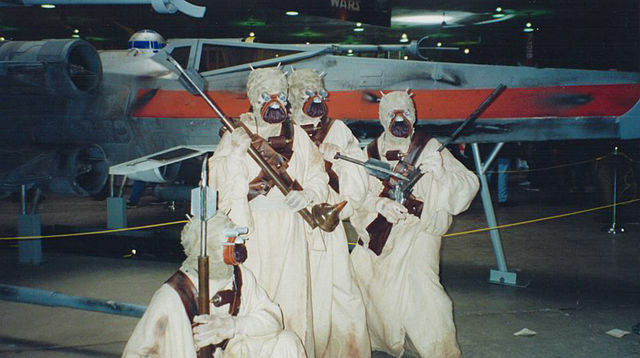 Military Analyst, Randy Fukwitz, said “Whilst the sand-people are mostly uninterested in what completely mental humans do in the name of their imaginary magic friends, they do take massive exception to any encroachment on Bantha feeding grounds. Tatooine farmer, Owen Skywalker, said “Bloody Isis, comin’ through ‘ere like they owns the place! No wonder them there sand people ‘ave got the ‘ump. I wouldn’t give you nowt for their chances, mind, not against the Tuskens. They’ll be Bantha fodder in no time, you mark my words. Which is unarguably the one certainty in the conflict. Posted on March 25, 2015 at 3:46 pm in Entertainment, International, Religion, Satire, War	| RSS feed You can	trackback	from your own site.